It is with heavy heart that I post the news that Rick died earlier this afternoon at age 64 from a heart attack. I’m stunned, as I know all of his fans, friends, and family are. My heart is with Holly, Rick’s sons, and all their family and friends. Christopher Golden posted on Facebook, “The life of a freelance writer is often full of financial struggles. The sudden death of Rick Hautala has left difficult circumstances in its wake, in more ways than one.” If you want to help Rick’s wife, Holly Newstein Hautala, Chris tells you how. 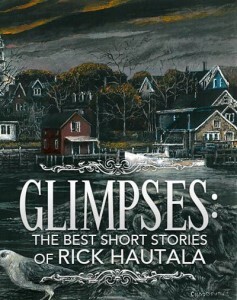 Nick Kaufmann: Rick Hautala R.I.P. 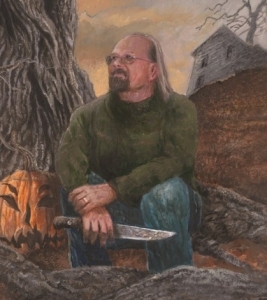 Brian Keene: Rick Hautala R.I.P. James Roy Daley: RIP: Rick Hautala. You will be missed. Kevin J. Anderson: A Dark Week for Horror…. A great guy and a fine writer who will be sorely missed. Condolences to his family and friends. My condolences to Holly and the rest of Rick’s family and friends. I’m so thankful for the opportunity to have known him. RIP. I’m very sorry to hear the news. I chatted with him online just a few weeks ago. I have been a fan for years, but only recently worked up the nerve to send him a message. He was so friendly and forthcoming, I wish I’d done so sooner. My deepest sympathies to his family. Keeping you hugged tight in our thoughts, Holly. Missing Rick so much. Rick was among my very favorite authors. I can’t even begin to guess how many hours of reading enjoyment his books and stories have given me. My sincerest condolences to his family and friends. My heart goes out to Rick’s family and friends. He is my favorite author and will forever be. Just the thought of not communicating with him about this work or that work of his pains me so. He loved what he was doing and it showed, especially throughout his later years. THE WILDMAN and INDIAN SUMMER are two of his strongest books and I urge anyone to read them. Heck, try anything with his name on it. He’s just so damn good. I will miss him dearly and will cherish every emails, signed books, forum discussions, and this one special PC disc featuring his many book covers. See you in another life, man. Really shocked to learn of Rick’s passing. He was a great writer, and a really nice guy. My heart goes out to his family. I’m shocked. I am a fan of Rick’s work and he was really kind to give me some advice’s about ISF. My heart goes out to Rick’s family and friends. I was so sorry to hear of Rick’s passing. A fellow adjunct at SMCC, I always enjoyed seeing Rick on MWF mornings and exchanging a quip or two. He really started my day off with a great vibe. I will truly miss him. Rick was very kind to me,too: a couple of years ago, we chated during many minutes in Facebook; I am from Brazil, and be sure that his Brazlian fans will never be the same without him around! Rest in Peace, Big Little Brother ! I was up last night trying to put into words what I’m feeling. This morning I got up and typed it all out. All I can do is let folks know how awesome he was and how desperately sad I am that I don’t have all those years ahead I was hoping for to get to know him better. Really SURPISED to hear of the death of Rick & just a day after James Herbert passed on. Been a fan for some years now, loved & still do his short stories. Really sad news. condolences to his family & friends. My husband and I are so shocked and saddened over the death of our good friend Rick Hautala. He was posting on his Facebook page on the wonderful projects coming up just a few days ago. He was such a talented writer author and very dedicated to the profession! This is a great loss to the creative community. My heart was in my throat when I read the first post of his passing. I just couldn’t believe it until I checked out a few things. I have been a fan for many years and he will be missed. My condolences go out to his wife, Holly and his boys, Aaron, Jesse and Matti. Rick was a great writer and more importantly a great person. My thoughts and prayers are with the whole Hautala family. I read The Mountain King about a year and a half ago and wrote a quick note to Rick on Good Reads, expecting nothing in return. Maybe a quick “thanks.” I was blown away when he not only responded but that we wound up talking about not only about Mountain King but how a writer must have the courage to take the story where it leads even if it is painful. Over the months that followed we chatted about Little Brothers and other works, both his and those of other writers that he enjoyed. I am reading James Lee Burke and James Elroy because of him. I am not a writer, just a lover of a great story, yet he always treated me like a friend even though we never met. I still have a couple of his books that I hadn’t gotten to but I know that I will love them but it saddens me that I won’t be able to talk to him about them and tell him how much I enjoyed them. My prayers go out to Rick and his family. Both my husband and I were very shocked to hear about Rick’s passing. He was a great neighbor and we’ll miss the times hanging out with him by the pool. Our sympathies go out to Holly and the boys. Through the years, Rick was such a kind, caring fellow Maine author. How I wish I had had the chance to tell him how much that meant to me. So very very sad today. I wrote this for Facebook, but I think it’s appropriate here too. When I met Rick in 1992 in NY, at my first Stoker Awards weekend, he only knew me as a beginner, but I was also a book reviewer already, and I’d reviewed a couple of his books. I’d referred to him as “Maine’s other horror writer,” a comparison it turned out he was quite sick of. Like he’d never heard it before! I didn’t realize this, thinking I’d been clever. But at some point I remember he mentioned how the comparison bugged him, maybe it was on some panel. I think I turned red on the spot. It took me a year or two, but finally I went up to him at another Stoker weekend and apologized for my faux pas… and he was typically gracious about it, laughing it off and making me feel better about the whole thing. He was that kind of guy, a genuinely friendly person and one of the legendary presences at Necon. Though I’ve never attended, I have no doubt that if I had he would have gone out of his way to make sure I enjoyed it. My thoughts are with his family and his many, many friends as well as everyone who loved his work, as I did. Safe travels, Rick. Rick was my writing teacher about 12 years ago at Southern Maine Community College . He was a wonderful man who could make the few boring aspects of writing look fun and cool. His humor and quick wit were such that his class quickly became my favorite to attend throughout my first two semesters. He ranks as one of the funniest and most peaceful people I’ve had the honor of meeting in my life. Also, I’m thankful to have had the chance to talk books with a genuine artist of the craft. His vast knowledge will be missed by everyone who knew him. Thank you for your books and work, Rick, and thanks for the laughter. You were a big help to me during a tough time. May your family and friends be at peace in this difficult time. Goodbye, Rick. His book little brothers, scared me so much as a teenager I quit babysitting. Its odd that the book popped into my head this month, and then I google the author and find he just passed. I am sorry for your loss, he was a very gifted writer. A Celebration of Rick Hautala on February 3, 2018!